Benefits of blue sapphire gemstones | Neelam: The Planetary Gems Co.
Blue sapphire belongs to the mineral species corundum or aluminum oxide Al2O3. Corundum's blue color is produced by traces of color-causing elements iron and titanium. It can be a pure, vivid blue but ranges from light greenish blue to deep, black blue and anything in between. Blue sapphire gemstone known also as Neelam, according to Vedic astrology, is the primary gem for Saturn or Shani. 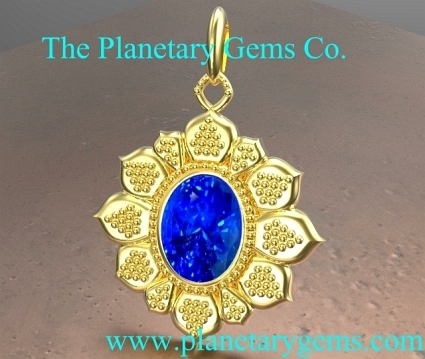 The ascendants that benefits the most for wearing a blue sapphire Neelam gemstone are Capricorn, Aquarius, Taurus and Libra. It can be worn as a ring, pendant or bangle. It should be set, ideally, in a white metal, best white gold or palladium. However we believe that the choice of metal is not as important as a clean and well cut blue sapphire. Therefore, the person can choose its appropriate precious metal. Many astrological blue sapphires are set in yellow gold. Wearing a blue sapphire, on a physical plane, may provide relief and protection from teeth diseases, impediments of the right ear, fevers and pains caused by colds, paralysis, asthma, rheumatisms, bone problems, black jaundice, gout, deafness, anxiety, depression, chronic diseases, cancers. -To develop wisdom, discipline, integrity and patience. - To reach spiritual achievements through humility. - To boost dedication and non-attachment. - To develop highest human qualities. - To achieve longevity. - To govern leadership and perfection. - To remove misery, adversity, sorrows, restrictions, denials, delays, accidents.